VIP DJ Entertainment provides temporary Special Event Lighting and tent lighting with power distribution for all types of events including weddings, bar/bat mitzvahs and corporate events. Our pro DJ lighting services include: up-lighting, pin spot lighting, architectural lighting, stage lighting design, audio visual effects, illuminated truss towers, table lighting, color changing LED lighting, intelligent moving lights, decorative lighting, party lights, and much more. From pin spotting your centerpieces, to personalized gobos, event lighting can be a wonderful addition to your affair and is often necessary to bring out the beauty of your florist’s decorations. Need a total transformation? Let our lighting designer guide you through creative choices that will enhance your affair and create the perfect atmosphere. 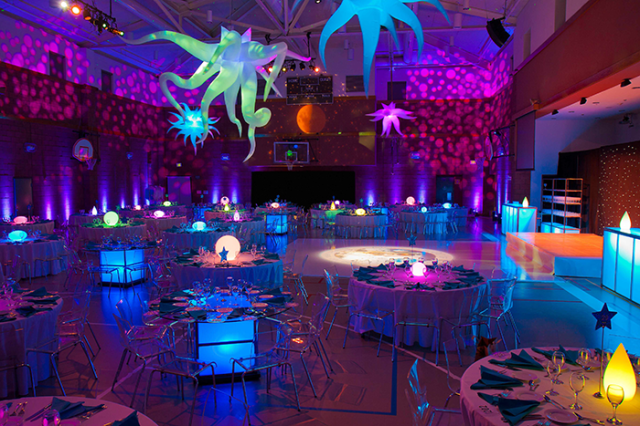 Call us today to schedule an appointment with our VIP Lighting Team @ 323-691-1001. 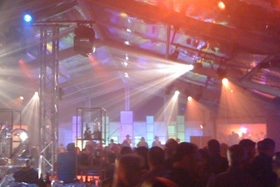 Dance floor lighting creates ambience, and a distinction between dinner and dancing time. Intelligent lighting, spotlighting, or even a mirror ball can draw your guests faster to the dance floor than their favorite song!